Today I was to move my motorhome, a 2002 Itasca Horizon 34H. Got in it and cranked it up. It cranked and started but then suddenly shut off (after 5 seconds of running). I lost all power in the dash board, no gages or no indicators bulbs lights up.. Nothing happens when I turn the ignition key. Have not found any bad fuses up front in the fuse panel. Traced the problem to not having any power to the fuse panel for instrumentation and dash controls. Under the dash, by the drivers feet, on the "firewall" there are a positive and negative terminal studs. The positive stud has no power, and I think from this stud there is a positive wire going to the fuse block. From where is the power coming to this positive stud on my 2002 Itasca Horizon 34H. I'd start at the chassis battery and trace power out from that. It could be the large circuit breaker or fusible link in the positive cable. If you have a battery disconnect solenoid on the chassis battery, it could also be there. 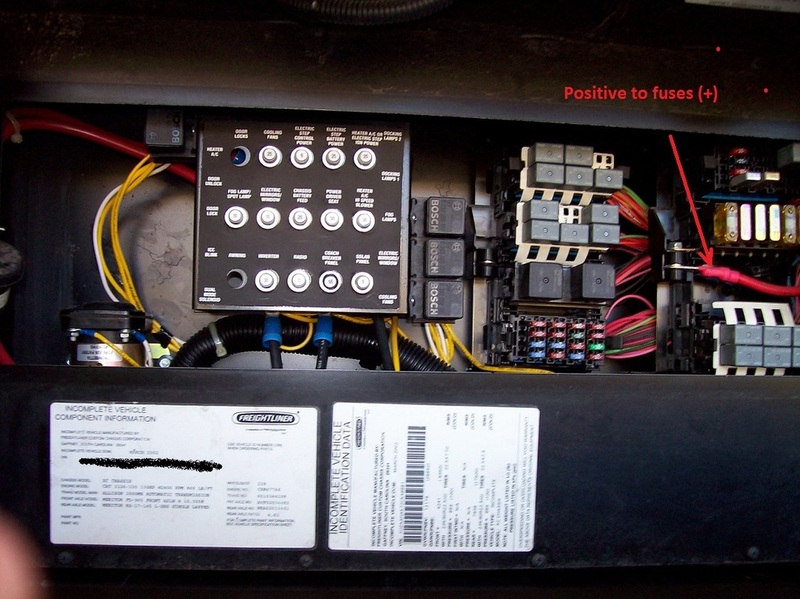 Assuming that you have already checked all battery connections, and checked the battery cables for corrosion, then I'd look for where the Itasca fuse box gets its power from the freightliner chassis. Freightliner has some high amp fuses located along the chassis rail that sometimes fail. Call the Freightliner Help Line (1 800 ftl help) (free) and have your last 6 digits of your vin number handy. They can help you determine how the power gets from the batteries forward toward that fuse box. Thanks Fred, if I don't find anything obvious, I will call Freightliner. I tried to trace the power from the battery to up front, but they all end up in a big wire loom and I did not start to cut wire ties yet. I am pretty sure it ends up here somehow, and then on the inside of the RV continues to the fuse box. 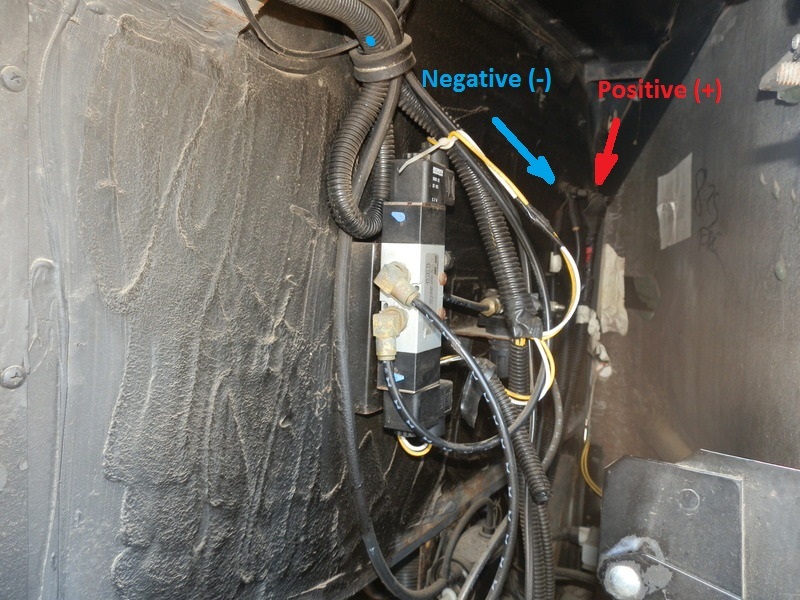 The pictures below are not from my RV, but they are very representative where the power wire comes in from. I think these are what Mr Cooper is referring to. They are located on the passenger side frame rail near the batteries. Check them for corrosion or loose/broken connections. I had the exact same thing happen to me, it was the cut out solenoid. It would make contact when engaged but the contacts were corroded. Two weeks ago i had the same thing happen, no start, no dash lights and it appeared to have no power on the chassis side. After calls to Thor and Ford MH customer care the only thing they thought was the battery disconnect solenoid under a circuit board near the brake master cyl, it wasn't that. I checked all batteries, disconnected them for 1/2 hr to maybe reset whatever and every fuse i could and still nothing. What started this problem was ME, i had bought a 6" extension cord to the OBD11 port to make it easier to change the 5 star tune. When i got to the prompt to turn to the on position but not start thats when everything went dead. So now i get to use my Coach net roadside tow. Luckily i have a ford dealer who services all MH's not far away. Coach net was awesome from my first call to when the wrecker showed up was just over an hour. Boy that was one large wrecker and he knew what was needed for MH tow, very professional. Took all back roads and never went over 30mph. Back to the problem at hand.... Traveling with the wrecker 1/2 way into the 12 mile trip the driver notices my headlights came on. Once at ford and unhooked it appeared all is well and MH starts right up. I left it there and the following day i get a call that a complete diagnostic was done and found nothing. Only advice was not to use that 6' extension. They did a multi point check on brakes hoses etc. and charged me $105. The one thing i thought is once awhile ago when i disconnected from shore power i went to check my battery monitor inside the coach and nothing, after longer than normal maybe 20min i heard a click and monitor was working. Didn't think to see if dash and no start. Thought possibly the converter took longer than usual to reconnect. Never happened again so i gave it no thought, still learning about our new to us coach. I really wish they found something that failed as our next trip in a week will have me hoping another tow isn't in my future. Wish i hade some input for you and will be following your progress. Good luck to us both. The main power to the stud at the front of the coach is supplied through a 135 amp Circuit Breaker at the location indicated, by Jamin. Here is a slightly different set up as viewed from under the battery tray , starter solenoid ( relay) , chassis battery C/B and coach battery C/B . The power cables to the front of the coach , for both chassis and coach circuits are protected by these C/Bs. This thread is about an electrical issue on a Freightliner chassis with a diesel pusher. I think you'd get better help on the Ford chassis Forum. Fred, Jamin and Skip are spot on. Finally found the CB's, had to access them from above (under bed), from inside of coach. One of the CB's had failed and had lose parts inside... (rattled when shaken). Got new CB's at Freightliner, replaced both and now OK.
Glad you solved the problem and posted the solution!! Glad you got things working properly. Thanks for wrapping up you post. Note, the circuit breaker shows up in the wiring schematics and diagrams that I got from F/L for my chassis, although actual location does not . If you don't have those documents may be a call to Freightliner , with your serial number, will get them e mailed to you , good things to have on file . Sounds like a bad ground.. Check chassis ground.. Battery connections... Etc.. Thanks for your input , but fooler , already got back and reported, in post #10 that he has found and fixed his issue.